The eLearning Guild has launched an interesting content creating and sharing program, called the Learning Exchange. 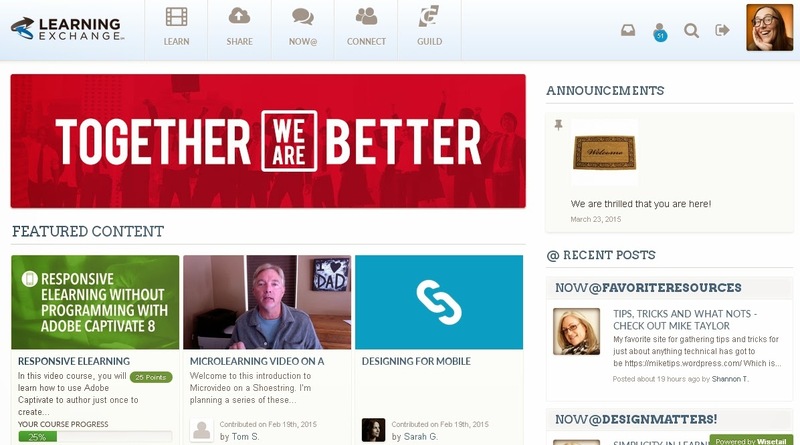 The idea is simple: let your members share their expertise (fits any expert learning format). The nice thing is that we all get to know each other better, and it provides us a stage to share eLearning content that we make anyway. There have been similar platforms, but they sometimes faded over time. With the eLearning Guild having so many members, eLearning experts, I feel that this initiative might just work pure on the basis of its rich community. And it is more practical then for instance the Educause discussions, as it is about providing training, getting tips and solutions for real life eLearning challenges. The platform also provides a discussion area, called NOW@ as well. The platform is being populated, so it is growing week by week, but I really like the initiative. And wondering what content I could share on it... just for fun and connecting. So what do you need to do to get access to the platform? At this point in time, you just need to provide the eLearning Guild with your contact details and eLearning profile. And from there you can peruse the content for free, take courses, select content bits and bobs, AND even add content in a variety of media: text, articles, webinars, or multimedia. Depending on the type of media, you might be asked to download certain features (e.g. when I wanted to view content on ADDIE versus SAM, I needed to download a Blackboard Collaborate tool, but it worked smoothly). So you can learning from any type of content or topic you like and is available (there are a meaningful categories and tags to choose from). As you move through the content, you can mark the content you have reviewed as 'done'. If you mark specific content as done, you 'earn' points, which indicate your interest or action inside of the Learning Exchange platform. Not all the uploaded media is unique, I found videos which were TEDtalks, YouTube movies from eLearning companies, or blogposts from the authors... but it did not bother me that all the content had a different feel to it, as long as the content was of intereset. It is a bit of OER, but with a corporate twist - so not that open to all, as you need to login (as well as different copyright licenses). The thing I like is that this Learning Exchange platform can be explored without extra cost, that it shares content coming from people who work in eLearning, and that it connects all of us in an immediately meaningful way. But what about the quality of the contributions? It is simple, you share what you think is of sound quality, and peers can than add comments, like it (or not), and rate the content you share. A bit like an old school 'competence and usefulness' discussion forum approach, but with new contemporary additions.